Product #60666 | SKU WLC-T03-HL | 0.0 (no ratings yet) Thanks for your rating! The Tilta Nucleus-M Left Handgrip provides fingertip lens control while also functioning as a handgrip support for your camera rig. This component of the separately available Nucleus-M FIZ (focus/iris/zoom) system enables you to split control between the handgrip and the hand unit as you prefer. 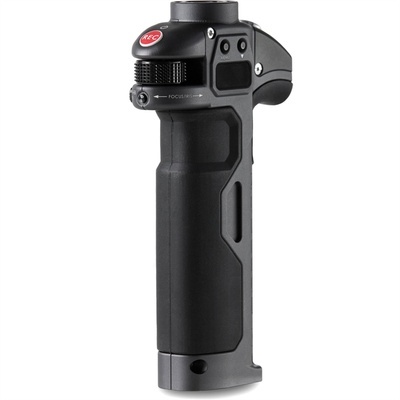 With a wireless control range of up to 305m, the Wireless Handgrip can be used for drone or car-mounted shots in addition to handheld configurations. Mount the handgrip using its ARRI-style rosette or use an optional adapter to mount to your gimbal. Use this grip with a separately available right-side grip for full focus, iris, and zoom control of cine-style lenses. Handgrip features include three knob-rotation settings, optional adapters for either bar- or ring-based gimbals, LED indicators, and an LCD display. An optional thumb joystick is available separately for the left handgrip. Powered by two 18650 lithium-ion batteries (not included), the handgrips can maintain a single charge for up to two days. As part of the Nucleus-M system, the Wireless Handgrip provides a run/stop function for select cameras.